Perhaps less frequently used than on the 11th and the 22nd, the 33 remains nevertheless a master-number endowed with a very good superior vibration. By doubling the 3, it is communication and luck that are put forward. The 33 is in relation with the world of the speech and by extension, that of the exchanges. If we also look at the combination of 11 and 22 (which give 33), we can deduce that this number offers a mixture of intuition and dreams, with the notion of transmission. Whether by word or by writing, the 33 seeks to convince an audience. Finally, the 33 is also in relation to the attention to the other and its needs. The qualities of number 33: altruism, communication, intelligence, clarity of vision, teaching, enlightenment, spiritual awareness, harmony. The defects of number 33: Eccentricity, hysteria, unnecessary sacrifice, negativity, dispersion, criticism and moralizing. 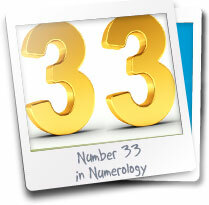 The 33 represents a vibratory energy of universal and unconditional love. In other words, the 33 has the capacity to welcome and tolerate the differences of the other. He knows how to talk about things that are wrong. With calm, he will unroll what he has on the heart and expect from his partner the same communicative qualities. It can, however, focus too much on these brain exchanges and neglect the physical or even pragmatic sides of a relationship. He needs permanent renewal. With the energy of 3 + 3, he is sensitive to the beauty of the Other and is easily seduced. This is not the most faithful profile of all. One can imagine 33 in a profession related to communication. With the qualities we have seen, the 33 is often moving towards a commercial path. He is the first to know how to convince with strong arguments and a persuasive force that is not overrated. Malin, the 33 can also change his tune if needed. He always falls on his feet, like a cat. But in the end, he aspires above all for harmony at work. He is willingly perfectionist but knows how to compensate this character trait by his natural altruism. The 33 must finally be careful that we do not abuse its flexibility and that we do not try to take advantage of him. Flexible and fast, the 33 is made for movement. He has every interest in finding a sporting activity, whether it's just walking or playing ball games, for example. He is not particularly attracted to the showdowns but is much more talented or skillful when it comes to coordination. He also knows how to adapt to the seasons, environments and challenges of his environment. Highly spiritual, 33 may not be as physically energetic as 11 or 22, but it has a positive spirit that allows it to make the most of its potential.